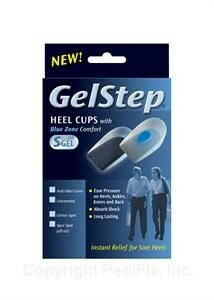 Soft Gel Cup with even softer Blue Zone for extra cushioning, protection and relief of heel pain. In a clinical medical study, this exact design was proven ‘most effective’ compared to several different treatment options for relieving heel pain. 1 pair.